1 The Great Wall of China is one of the world's most famous ancient military structures. It stretches more than four thousand miles from east to west. For thousands of years, this fortification served China exceedingly well. It helped block the advances of northern nomadic tribes. Without it, China would have had a hard time fending off intruders. 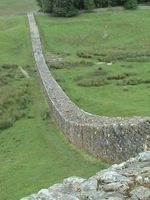 2 Certainly, the Chinese were not the only people to have ever thought of building a wall along the borders. It is just that theirs was both the oldest and the biggest undertaking that we know of today. To visit other similar structures elsewhere, we can take a trip to Great Britain where there is Hadrian's Wall, built by the Romans. 3 The Romans made their first invasion of Great Britain (known only as Britain back then) in 55 B.C. But the troops, led by Julius Caesar, did not linger there for long. Almost a century later, the Roman Emperor Claudius picked up where Julius Caesar had left off and conquered pretty much the whole island in 43 A.D. By the time Hadrian came to power in 117 A.D., the Romans had already built several forts across northern England. They were linked by a road called Stanegate, which stretches from west to east between Carlisle and Corbridge.